Evidence-based medicine is a concept that has come to the fore in the past few years. Clinicians are increasingly encouraged to practise patient management based on available evidence in the scientific literature. For example, new pharmacological therapies are only used when large randomized trials have 'proven' that a particular drug is better than existing ones. This is also the case in surgical specialties, although surgery has traditionally seen a lack of use of this information, with individual surgeon's preferences being most influential in treatment choices. However, more recently, there has been a large expansion of trials and studies aimed at providing surgeons with information to guide their choices using firm evidence. <br /> This new edition has been revised and expanded to include new data where relevant, and also features a new chapter on pituitary surgery. 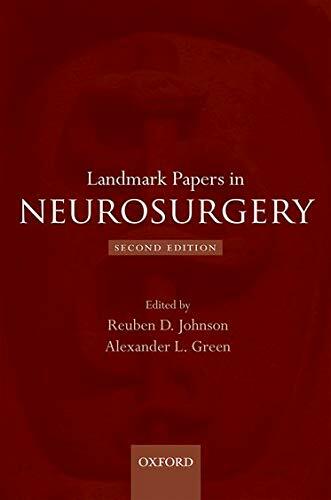 Landmark Papers in Neurosurgery, Second Edition, remains a key collection of the most important trials and studies in neurosurgery, allowing the reader to rapidly extract key results, and making it essential reading for all neurosurgeons and trainees in the field.